Watching the same group of horses week in, week out, it is easy to get distorted views of how good some of those horses really are. This blog has undoubtedly been guilty on more than one occasion of describing a particular performance as “great” when what has actually occurred is that an average horse has beaten sub-standard opposition by an unnecessarily wide margin as its jockey has had a restless whip-hand. Today, however, it can confidently be written that – in Korean racing terms at least – we witnessed greatness. Forced by the handicapper to drag 62 kilos around ten furlongs of Seoul Race Park, Dongbanui Gangja barely seemed to notice the burden as he glided away from thirteen rivals to secure his eleventh consecutive win. Usually impressive, Dongbanui Gangja looked ungainly in the paddock. Not on the track though. The horse he wrested the Grand Prix crown from was there and it was Bally Brae who set the early pace under Moon Se Young before Dongbanui Gangja, who had dawdled out of the stalls, cruised to the front as they turned for home. Entering the home-straight, the five-year old, with Choi Beom Hyun at the controls, as usual ran excessively wide. It seemed though that this was just so he could beat his rivals again as, with minimal prompting from Choi, he loped away for a three length victory from Obaek Yechan. Bally Brae ran on bravely for third. 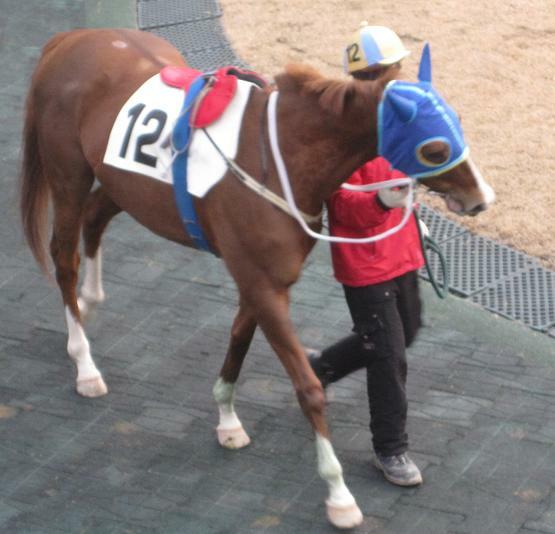 Dongbanui Gangja [Broken Vow – Maremaid (Storm Bird)] is now unbeaten since September 2008 and it is no exaggeration to say that there is not a horse on the peninsula that can at present come close to him. If he stays fit, then a second Owner’s Cup in June looks a formality and at this stage, few would bet against a historic third triumph in the season-ending Grand Prix. There is one three-year old, Tough Win, who is talked of as a potential challenger. It will take a very special horse to beat Dongbanui Gangja. Earlier in the day, Money Car did his Classic claims no harm as he led from start to finish over the Derby distance of nine furlongs in race 8. Since suffering his only defeat on his racecourse debut, Money Car hasn’t been troubled into a gallop. Whether connections point him towards the KRA Cup Mile at Busan or wait for the Derby at Seoul, Money Car [Newsprint – Pinocchio (Big Sur)] is likely to be making a serious drive for Triple Crown honours this year. Down at Busan, last year’s underachiever as a three-year old started his four-year old career in a similar way. Yeonseung Daero flopped in the 2009 Classics but showed his evident class by scoring big wins late in the season and, with a big year expected of him, was sent off favourite in his first outing of 2010. Indeed, such were the expectations of the colt – and much to his connections’ credit – he was pitched in against foreign-bred runners instead of taking the safer option against fellow Korean-breds. It was not to be, however, as Seonnyang Yongsa scooped the day’s big race by a length from Hardride with Yeonseung Daero only managing fourth. Doing better than that was Busan new-boy Kunihisa Hirase. The Japanese jockey made his debut on Friday and scored his first win at the track this afternoon taking Classc possible Baekjeom Manjeom to a narrow victory in race 2. 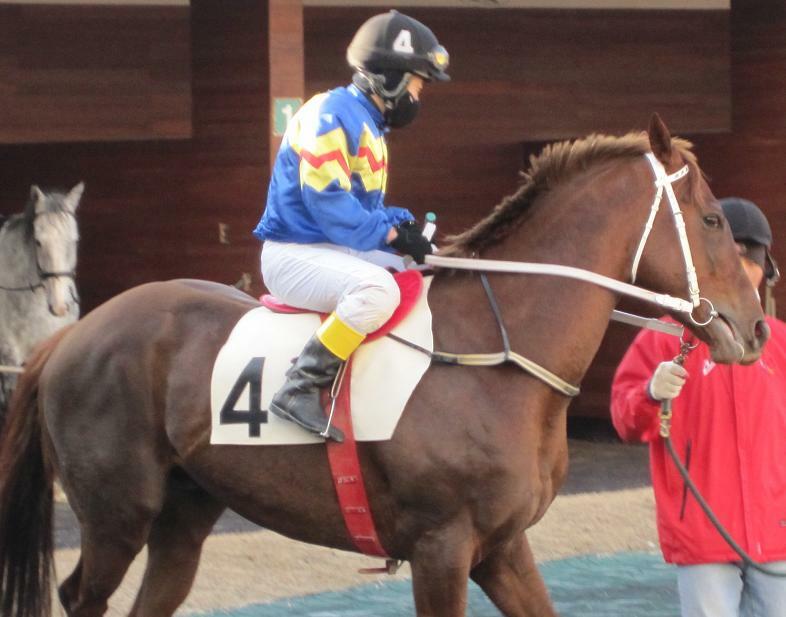 Dongbanui Gangja, Korea’s best horse, will make his first appearance of 2010 at Seoul Race Park on Sunday afternoon. The double Grand Prix winner will face the horse he took that title off when Bally Brae lines up alongside him in the ten furlong test. Despite carrying 62 kilos – the largest handicap weight awarded for some time, Dongbanui Gangja will likely be heavy favourite to get the better of a full field of fourteen. 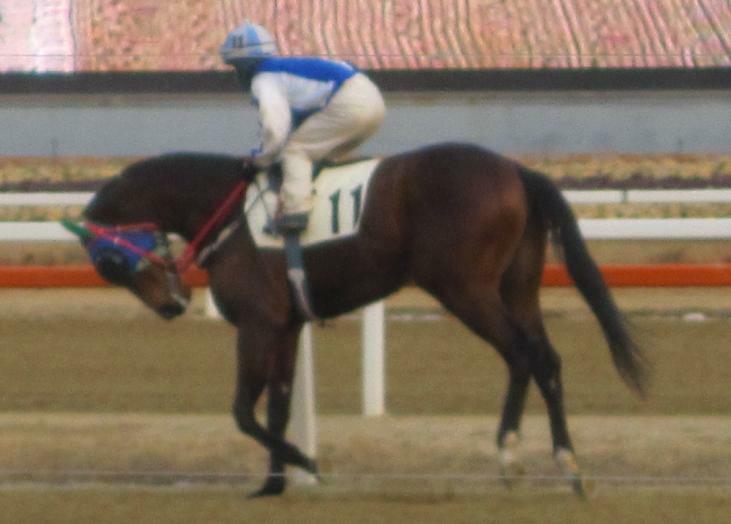 Down at Busan, Yeonseung Daero makes his highly anticipated four-year old debut. The nearly horse of 2009, great things are expected of him in 2010. He’ll take on foreign bred horses in Sunday’s feature including such luminaries as King Kephalos and track stalwart Golding over nine furlongs. Friday at Busan and Saturday at Seoul are relatively low-key affairs although Japanese rider Kunihisa Hirase will debut at Busan on Friday. 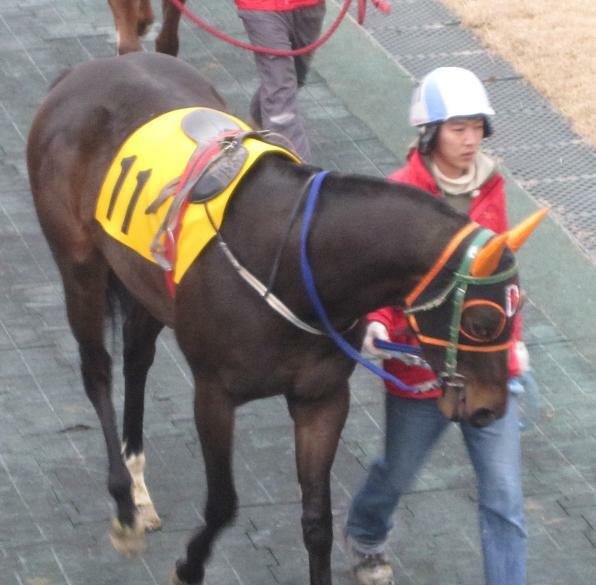 Of interest, however, will be the appearance of three-year olds Money Car and Great True at Seoul. The former is a Derby contender, the latter an import that we could see running for big prizes later in the year. Another Japanese rider arrived on Korean shores this week and will make his début at Busan Race Park this coming Friday. Kunihisa Hirase is thirty-years old and has held a licence in Japan since 1996. Over the course of his career, Hirase has ridden 993 winners from 7050 rides, picking up some notable victories along the way. Most recently, he has ridden at Kanazawa Racecourse where he has been competing alongside former Busan star Toshio Uchida. Hirase’s arrival takes the size of the Japanese contingent at Busan back up to two after the departure of Eiki Nishimura at the end of last year after an up-and-down few months. He joins Hitomi Miyashita who has quickly become one of the weighing room’s hottest properties since joining last October. In addition to Hirase and Hitomi, there are two other foreign riders at Busan. South African Martin Wepner is, alongside Hitomi, one of the track’s stars while Eden Cheung of Hong Kong is yet to really get going, currently sidelined through injury after one win from thirteen mounts. 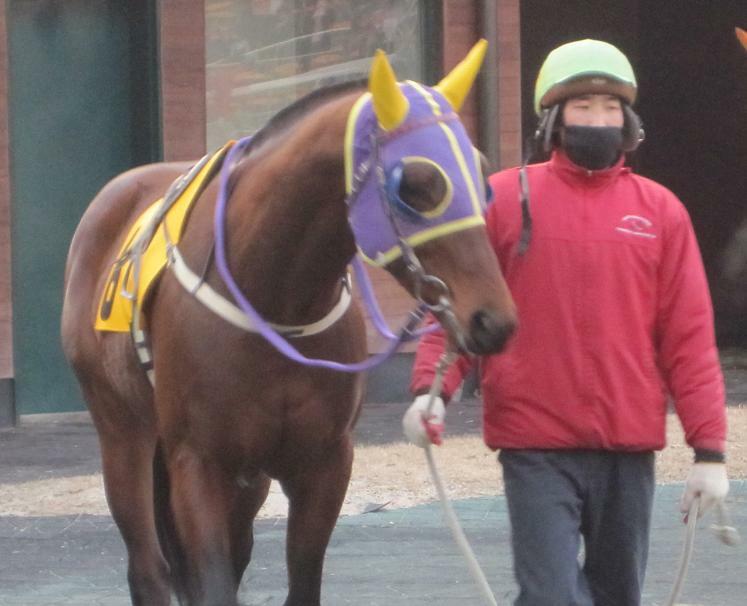 Hirase debuts on the useful four-year old Cheonman Yeongung in race 1 at Busan on Friday. As ever, Shaka is on the case with pictures and video of Hirase in action. 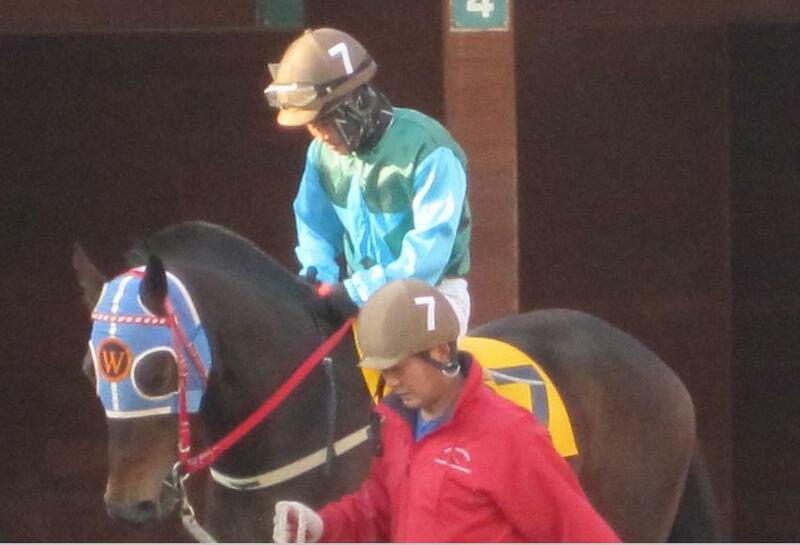 He’s nicknamed the “Smile Jockey” but Kim Ok Sung wasn’t doing an awful lot of smiling at Seoul Race Park this weekend. On Saturday the jockey, a twenty-two year veteran of the track, ran into difficulty on a horse named Murim Choegang in race 6. The four-year old was sent off favourite for the eight and a half furlong race but was at the back of the field until they entered the home straight. Passing horse after horse in the final two furlongs, Kim and Murim Choegang finished third and a summons to the Stewards’ room was inevitable. Stewards decided that Kim was responsible for Murim Cheogang being off the pace and handed him a ten-day ban – which will rule him out until the end of February. Another slap on the wrists for careless riding in race 8 capped a miserable day. The suspension is a big blow to Kim, who has only recently returned from a three-month lay-off after an injury sustained during trackwork. But his bad weekend was just getting started. On each raceday five jockeys are selected for a random breath-test. Almost inevitably Kim Ok Sung was one of those names pulled out of the hat on Sunday morning and sadly for him, he had evidently been indulging on Saturday evening. With a blood alcohol level above the allowable threshold, Kim was stood down from his Sunday rides and handed a further four-day ban on top of the ten days he received on Saturday. To add insult to injury (or to a headache anyway), one of the mounts he missed out on was 100/1 shot Daewangho, who was guided to a shock victory by Park Byeong Yun. See you in March Kim Ok Sung! * Stewards reports from each raceday at both Seoul and Busan are produced in English and can be downloaded from the results pages. Last year’s top three-year old filly and colt were both in action this afternoon. And it was Sangseung Ilro at Busan who began her four-year old career on a high while up at Seoul Nice Choice faded in the late afternoon gloom to slump to a rare defeat. Punters had much more faith in Nice Choice, sending him off long-odds on for the 1900 metre class 1 race in the capital. That seemed to be justified as Cho Kyoung Ho kept the favourite well-positioned as the field made their way through the back-stretch and around the home-turn. When he was asked to sprint, however, there was nothing. Meanwhile Holy Dreamer and Machine Gun arrived to take things up but neither could match 100/1 outsider Seungundaeseung who emerged from the field to take a shock victory. Nice Choice finished fourth, two lengths behind the winner. Now six-years old, Seungundaeseung [Buster’s Daydream – Wang-San-Mo (Eagling)], has been an inconsistant perfermer throughout his career, a pair of back-to-back victories last summer which elevated him to class 1 the highlight. Until today. Down at Busan, Sansgseung Ilro had no such problems. 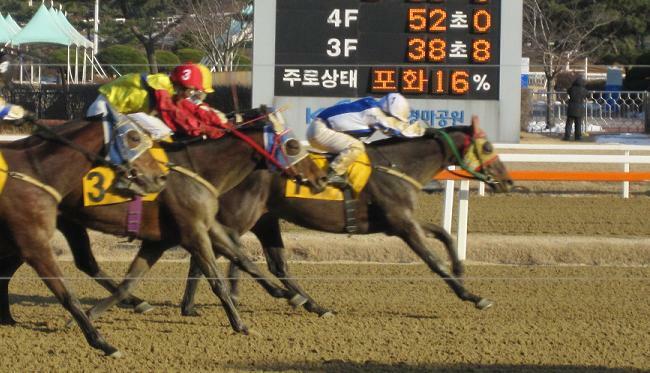 Although Jo Sung Gon was forced to take the double-classic winner very wide as they entered the home straight, she relentlessly ran down second favourite Yeongung Manse, catching and overtaking the five-year old gelding in the final furlong and then running on for a comfortable two length win. 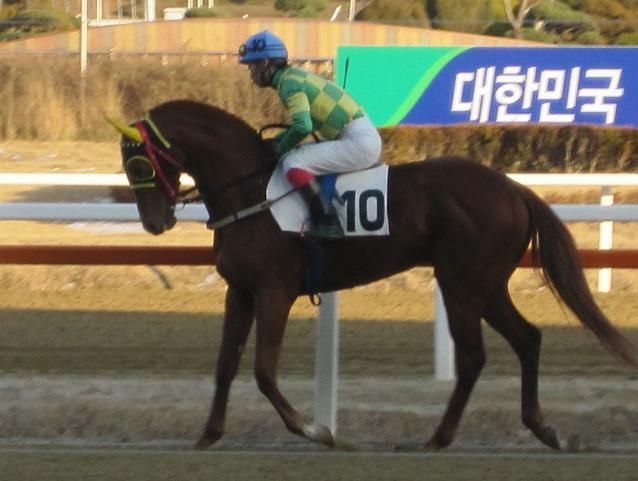 It was Sangseung Ilro’s first victory since the Derby up at Seoul last May. Injuries restricted her to only three further outings as a three-year old, all ending in battling defeat. Looking as sound as she ever has, Sangseung Ilro begins life as a four year old looking like she’s back at her best. While Cho Kyoung Ho experienced disappointment on Nice Choice, once horse that looks sure to brighten up his year is Tough Win. In race 9, Cho partnered the three-year old to his fourth straight win in as many outings. Stepping up in distance to nine furlongs, Tough Win [Yonaguska – Maggie May’s Sword (Sword Dance)] was once more unchallenged as he cantered away from his class 2 rivals. It’s still early days but this horse seems the real deal. Today the margin of victory was ten lengths but he was never asked to extend himself. Punters are already anticipating a possible showdown with Dongbanui Gangja later in the year. He was late arriving on the scene but Bulpae Gisang got just up in time to secure victory in the feature event at Seoul Race Park this afternoon. Winner of the Busan Metropolitan and second in the Grand Prix to fellow Kim Yang Seon trained Dongbanui Gangja, Bulpae Gisang is widely considered to be behind only his illustrious stablemate on current form. That didn’t stop him being sent-off at slightly better than even money, however, and as Haengun Daewang led the field into the home straight, it looked as though punters had been wise to be cautious. Park Tae Jong had things under control though and brought Bulpae Gisang down the outside to hit the front just metres from the line. Baekjeonmupae came along on his inside to grab second with Haengun Daewang hanging on for third. It was an eighth win for Bulpae Gisang [Lightnin ‘n Thunder – Neat Trick (Clever Trick)], and the American bred four year-old looks set to running for big honours later in the season. Who’ll be joining him and Dongbanui Gangja as the top overseas-bred horses is up for debate. Tough Win [Yonaguska – Maggie May’s Sword (Sword Dance)] looks sure to be one of them. He runs tomorrow but the only horse to get close to him in his three runs to date is Cheonho. He ran this afternoon and duly picked up his second win in the seven furlong race 10. It was a big ride for Toshiyuki Katoh who doesn’t get the opportunity to ride good things very often. The Japanese rider made no mistake as he calmly took Cheonho [Macho Uno – Meadow Peace (Meadow Lake)] to the front turning for home and then galloped away from the field in the straight. Earlier on yet another sub-zero day in the capital, there had been a welcome return to form for the now five-year old Namchon Party. After finishing third behind Gaeseon Janggun in the 2008 Minister’s Cup, the then highly rated three-year old colt suffered an injury that kept him off the track for over a year. Returning just before Christmas, he was well beaten, but today, he was back to his best as he produced a fast final furlong to sprint away from Gwacheon Jijon and Concours in the class 2 race 8. With his record now five wins from eleven races spread over nearly three years, if he keeps fit, maybe this can be Namchon Party’s year at last. Sunday is set to be a big day. Aside from the afore-mentioned Tough Win, President’s Cup winner Nice Choice will be on show at Seoul while at Busan, the star-turn will be the Derby winning filly Sangseung Ilro who will look to get back in the winner’s circle in the feature race for the first time since the Derby. It’s set to be a star-studded weekend as some of the peninsula’s hottest properties take to the track at both Seoul and Busan. Busan and Jeju get things underway on Friday and the Gyeongnam Province track hosts two class 1 contests to finish the day. The first gives the track’s top horses a rare chance to compete for a big prize over just seven furlongs and Sinjin Gangja and Top Grade will be among those looking to claim it. That race is immediately followed by a nine furlong test for overseas bred runners. Crafty Louis tops the weights but faces interesting competition from the likes of lightly raced four-year old Dandi and from the Korean bred Impeccable. On Saturday the focus moves up to Seoul and Bulpae Gisang, winner of last year’s Busan Metropolitan and second in the Grand Prix, makes his first appearance of 2010. Regular rider Choi Beom Hyun is suspended so Champion jockey Park Tae Jong gets the mount for what should be a straightforward win although Bulpae Gisang will be giving weight to both Angus Empire and Baekjeonmupae, both horses with plenty of wins to their name. Sunday is set to be a treat at both Seoul and Busan. Down South, last year’s Derby winner Sangseung Ilro faces Pangpang, the filly who beat her in the Oaks, in the feature. Don’t be surprised if neither of them win, however, as also going is Yeongung Manse, winner of the Governer’s Cup in 2009. Up in the Capital meanwhile, President’s Cup winner Nice Choice makes his début as a four-year old. He should have the beating of a field including Machine Gun and the still slightly unknown quantity of Holy Dreamer. Sunday’s race 9 also sees the seasonal début of the current highest rated three-year old on the peninsula in the shape of Tough Win. The American import in three for three and will attempt two turns for the first time.